After his 1984 tour, Frank Zappa put his guitar down for four years before one last live hurrah. In the interim years he issued a number of studio and archival live recordings. Amidst that flurry was 1987's limited edition cassette released in conjunction with Guitar World Magazine and by mail order from his own company. It was called The Guitar World According To Frank Zappa. Times being what they were for me, somehow I missed this one back in the day and its been unavailable apart from that cassette (and numerous bootleg versions) over the years. For the Zappa completist it is notable as it contains some material exclusive to this release. 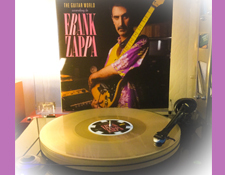 Fortunately, a new edition of The Guitar World According To Frank Zappa is being released for Record Store Day (RSD) later this week on lovely 180-gram clear vinyl pressed at Furnace. I was happy to receive an advance copy to check out and hopefully whet your RSD shopping pallate. The eight-song mini LP sounds crisp and clean, in the way that many of Zappa's 80s productions tended to sound. While some of the original sources here were probably analog there is likely some digital enhancement in here somewhere along the way -- hey, it was the 80s and Frank was deep in his digital groove by then so it stands to reason this was taken from his master made at the time for the cassette release. That isn't a bad thing, mind you and this one actually sounds real good once you get acclimated to the bright feel of the album. The clear vinyl is quiet and well centered and it was all mastered by Chris Bellman at Bernie Grundman Mastering. 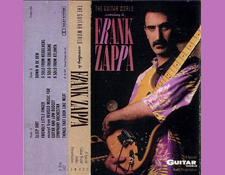 Ultimately The Guitar World According To Frank Zappa is all about the music and the guitar and there are some gems here. The album starts with the under-appreciated, achingly beautiful duet called "Sleep Dirt" -- one of the only tracks Zappa ever issued recorded on Acoustic Guitar. There are several examples of Zappa's compositional production process here which he dubbed "Xenochrony" -- a methodology where he would extract portions of recordings from different sources to make a new mash up work that probably would never have been possible to create otherwise. "A classic "Xenochrony" piece would be "Rubber Shirt", which is a song on the Sheik Yerbouti album. It takes a drum set part that was added to a song at one tempo. The drummer was instructed to play along with this one particular thing in a certain time signature, eleven-four, and that drum set part was extracted like a little piece of DNA from that master tape and put over here into this little cubicle. And then the bass part, which was designed to play along with another song at another speed, another rate in another time signature, four-four, that was removed from that master tape and put over here, and then the two were sandwiched together. And so the musical result is the result of two musicians, who were never in the same room at the same time, playing at two different rates in two different moods for two different purposes, when blended together, yielding a third result which is musical and synchronizes in a strange way. That's Xenochrony. And I've done that on a number of tracks." 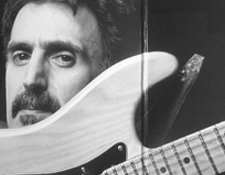 In an easier to digest manner, Zappa explains in the liner notes to The Guitar World According To Frank Zappa that it is "sort of like Monday and Tuesday crammed together into the space of Wednesday"
There is some killer stuff here! "A Solo From Atlanta" was recorded at the end of the 1984 and is pretty much better than anything else I've heard from that tour, the band is loose and Zappa is just on angry fire mode guitar playing wise, perhaps because the concert was apparently quite under-attended (according to the liner notes on the cassette/LP). This is -- according to the Wiki, at least -- a longer version than what appeared on the Guitar album as is "A Solo From Cologne." "Down In De Dew" is a fun bouncy track which was originally slated for the then unreleased Lather album and "Friendly Little Finger" is a pretty amazing almost Asian inspired piece from the Zoot Allures album. While this vinyl-only release of The Guitar World According To Frank Zappa is not on Tidal (yet!) you can hear some of these tracks on the albums they were released on (albeit sometimes in different mixes). Click on the titles here for "Sleep Dirt" (from the Sleep Dirt album) "Friendly Little Finger" (from Zoot Allures) "Revised Music For Guitar and Low Budget Symphony Orchestra" (from LÄTHER and Studio Tan) "Down In De Dew" (from LÄTHER) and "Things That Look Like Meat" (from Guitar). 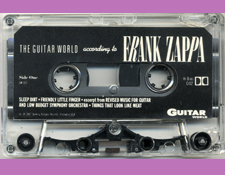 The Guitar World According To Frank Zappa is a fun release and if you are like me and don't have the cassette yet always wanted a copy, you probably need this. And if you have the cassette, you'll likely want this release as well because... well.. its a nice to have it in this larger, arguably better sounding playback format. Once again, many fine joys are emerging from the Zappa Vaults these days (including apparently a brand new remaster off of a safety master of Captain Beefheart's legendary Trout Mask Replica album!). I'll continue to try to keep you all apprised as new releases come up. Stay tuned.